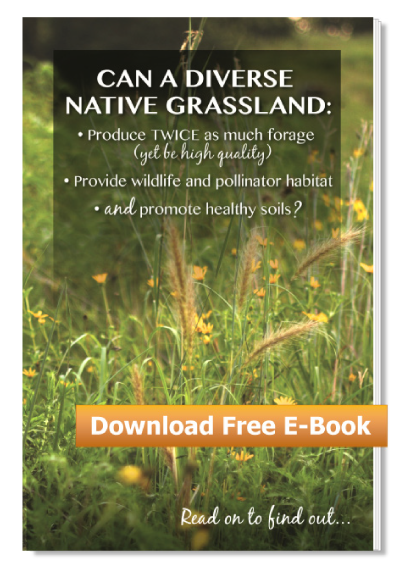 -Can a diverse native grassland produce more forage than a fescue field? -Can it produce high quality forage? -Can it provide wildlife and pollinator habitat even though it is being grazed? -And, can it create healthier soils? After killing the fescue, which was a process involving about a year, we planted a diverse native grassland. Realizing that each plant has a unique season of growth (i.e. some are green and growing in the cool weather of spring and fall while others prefer the hot weather of summer), we chose species that grew in various seasons. We wanted plants to be growing and collecting sunlight as much of the year as possible. We also realized that plants have unique root systems (e.g. deep rooted vs. shallow rooted, fibrous vs. tap rooted). We wanted to include this uniqueness in the planting so that we could use as much of the soil moisture as possible to grow forage whenever the rains came. Lastly, we knew we wanted to include native legumes because these plants would provide “free nitrogen fertilizer” to the pasture. In the end, we planted four functional diversity groups: warm season grasses, cool season grasses and grass-like species, legumes, and forbs (also called wildflowers). After the natives established, we began grazing. So what have we discovered about grazing a diverse native grassland? Well, to begin with, we are pleased with the quantity of forage production; it is currently equal to the production of remaining fescue pastures, and we have reason to believe it will continue to increase. We weaned heavier calves when they grazed natives than when they grazed fescue pastures, and the cows had better conception rates. The soil health and soil organic matter improved. We were able to provide excellent pollinator and wildlife habitat even while grazing the pasture. In spite of the grazing, we also had showy flowers in the pasture. Download our free e-book to read more details on all of this. We have learned a lot about grazing and natives. For instance, we have learned that the cows prefer various plants in different seasons; some, for example, are not very palatable early in the growing season but are quite appetizing later in the year. On the other hand, some plants try to bloom many times during a season if they are eaten off whereas others will not. In the end, we believe that a diverse native grassland is as good as it gets for the rancher, wildlife, and soil health. To read more about this project and the results, download our free e-book.